(Bloomberg) -- South Africa’s rand seems to be in plenty of investors’ bargain bins these days. So are the Colombian peso, Indian bonds and Chinese stocks as a slew of banks from Goldman Sachs Group Inc. to Morgan Stanley and Societe Generale SA advocate a return to emerging markets. Investors are searching for cheap currencies, stocks and bonds following an emerging-market rout sparked by concerns over a strengthening dollar and rising U.S. yields. But the days when money managers could rely on high growth and low inflation to fuel returns across most emerging-market assets are gone, according to SocGen. “The world has moved on very quickly from a ‘Goldilocks scenario’ in which investors were able to pick up yield in a variety of asset classes, to an environment in which significantly more discernment is necessary,” SocGen strategists including Alain Bokobza said in a note on Wednesday. South Africa’s currency has weakened 12 percent against the dollar since late February. 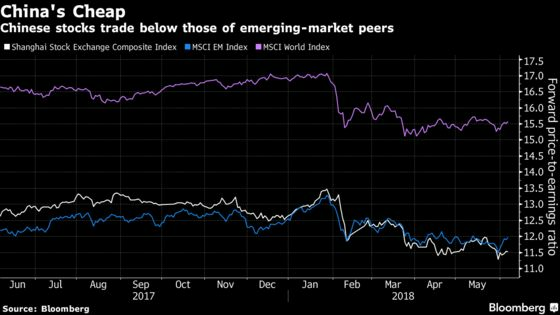 Morgan Stanley and SocGen say it’s probably oversold, a victim of its status as one of the most liquid currencies among peers and as a bellwether for emerging markets. 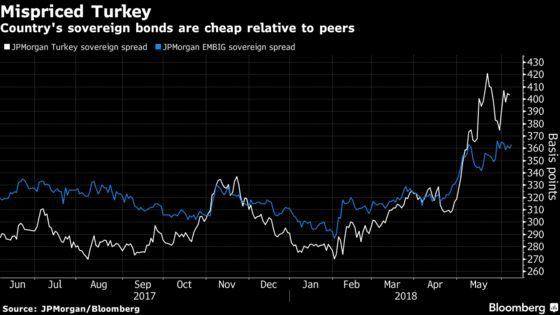 JPMorgan Chase & Co. is also bullish, holding an overweight position on South Africa’s local-currency bonds thanks to the rand’s expected stability and attractive real yields. It’s either neutral or underweight for all other local bonds among European and African emerging markets. Still, it can be a risky bet. 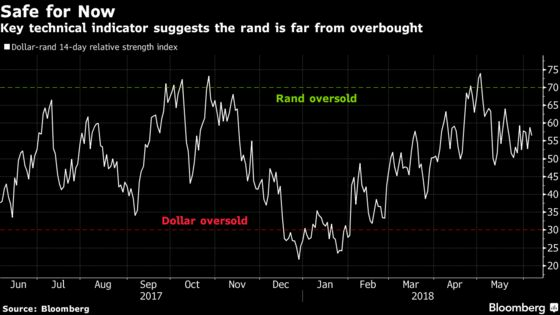 Strategists at Standard Chartered Plc closed long trades in the rand and rand-denominated bonds on Friday, just four days after entering them. That was after both trades hit their stop losses, or points at which investors should pull out of loss-making positions. Latin America’s fourth-biggest economy should be a beneficiary of crude oil prices that have climbed almost 60 percent in the past year. JPMorgan has it as the biggest overweight holding in its basket of emerging currencies. Nomura Holdings Inc. is also optimistic. Craig Chan, head of emerging-markets strategy at the Tokyo-based bank, recommends shorting the Brazilian real against the peso. 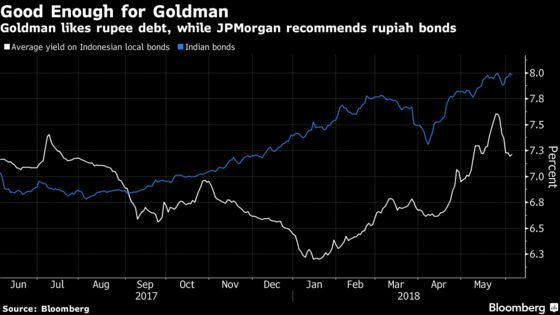 Goldman says that the recent selloff of rupee debt has gone too far and advises clients to buy five-year Indian government bonds. Yields on securities maturing in May 2023 have risen about 150 basis points since September to above 8 percent, the highest in more than two years. India’s central bank raised its benchmark interest rate for the first time since 2014 on Wednesday, setting the stage for a gradual tightening cycle as economic growth rebounds from a four-year low and price pressures build. SocGen and Goldman think investors should load up on Chinese stocks. The former says they will benefit from China’s growth rate, which at 6.5 percent is still one of the highest in the world. The country’s inclusion this month in MSCI’s indexes and a “low correlation with developed equities” also count in their favor. The forward price-to-earnings ratio of stocks on China’s main bourse in Shanghai has dropped to 11.5 from 13.5 in January. They’re now cheaper than emerging markets as a whole and substantially less costly than the MSCI World Index. Fidelity International sees value in Turkish external sovereign debt following the third rate increase by the country’s central bank in less than two months to stabilize the lira. The dollar bonds are mispriced relative to other BB-rated countries, while debt-to-GDP is moderate compared to may of its peers, according to Paul Greer, a London-based portfolio manager. The country is willing and able to repay its debt, he said.